I have been given this plant, but have no idea what it is. Is anyone able to help me out? When I was given it the soil was very damp and some leaves had yellowed. I have cut away the yellow leaves, but more have appeared. This is a type of ivy. Evenly water or and give it light. I think it is in the pennywort family. There are several types. My friend has it in her koi pond outside. I haven't seen it inside, but it looks nice in your picture! At first glance I would agree with Pghgirl40 that it looks like a member of the pennywort family and really resemble the Pennywort Dollarweed. The only problem with that is that pictures looks like it is a vine and from what I can find, the Pennywort family grows from one stem (maybe from rhizomes) so I'm not sure that fits this plant. Not many plants leaves grow from a stem in the center but I could not find a vine with a round leaf and a stem in the center. The leaf almost perfectly fits the Dollarweed but it is not a vine so I'm not sure we have identified this plant. Perhaps you could send a photo to a local Master Gardener group ans they might be able to Identify it. It looks like a nasturtium to me. You may have to wait until you get flowers to make a proper identification. I am so glad Jess mentioned nasturtiums as I thought this question would not receive a correct answer. 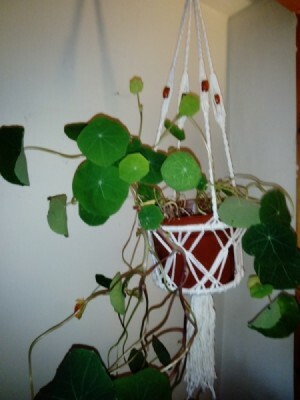 I originally looked at nasturtiums but I had never seen a vining nasturtium so I discarded that name. Now, after researching again, I find there is a variety that does vine/trail and they must be beautiful when blooming in a full basket. I believe your plant could use some pruning as it looks very leggy and should be rather full. Correcting the light and moisture problem may stop some of the yellowing of the leaves (some yellow is natural). Nasturtiums don't like to be over fed. They will thrive in poor soil and require very little fertilizer. I have noted a couple of sites that have some care instructions that you might want to check out. Wikihow always has clear instructions. This link shows the plant type and not the vining type but overall care should be the same.